We interrupt our regularly scheduled Friday programming to bring you the social experiment of the decade. And by “decade,” I mean today. Or right at this very moment. Whatever. This is not the social experiment where I stand in the middle of Highway 70, pointing up at the sky, trying to get commuters to look and then wait for the ensuing 68 car pileup. No, this is of much greater value than that, and believe it or not, even more entertaining. My close, personal friend Lanny Donoho is trying to get on The Jay Leno Show. Now, for those of you who have heard of Lanny, you are now convinced that I am blowing smoke that he’s a close, personal friend. After, all, the “CPF” tag is what Unknown Christians always say about Professional Christians, such as Lanny. But I’ve known this guy since I was a teenager and he was drawing his first Social Security check. I have his cell number (not that he ever answers) and he has mine (which explains the late night crank calls). We did a tour in ‘Nam together. His oldest son’s name is Andrew and my name is Danny and the first three letters of each of our names are the same which means that he named his son after me. And once I asked him, “Lanny, settle it once and for all: am I your close personal friend?” And I can almost be positive that he said yes. And now that he’s 122 years old, I want to help him gain a national audience. Editor’s Note: Tell ’em why you really want to help him. Because I got a direct message from him on Twitter early Friday morning questioning my allegiance to our friendship because I haven’t stepped up to the plate on this social experiment thing and he also may or may not have said disparaging things about my mother. If you don’t know Lanny, he’s a big deal in the world. He’s the host of Catalyst, a big-deal gathering of thousands of leaders who get together annually to groom their goatees and compare fashion tips about shirts with embroidered dragons on them. He’s founded a slew of organizations designed to bring relevance to the church, purpose to the lives of teenagers, and relief to other countries in the world. And that last accomplishment is exactly the reason he wants to be on Leno. Lanny is part of a couple of organizations called 143million.org and 410Bridge, which is changing the face of Africa and around the world. Which brings us back to the social experiment. At this very moment there are 13,000 people attending Catalyst in Atlanta, and Lanny has every last one of ’em tweeting #lannyonleno. 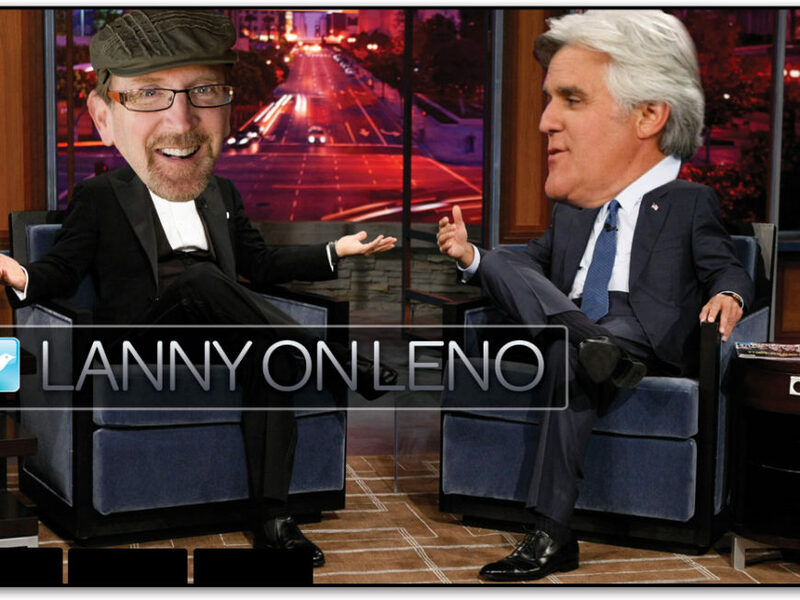 The hope is that Leno’s people will take note of Thursday’s Twitter crash (coincidence? I think not.) and bring Lanny on to the show, where he will display his collection of falcons and poisonous snakes. Editor’s Note: I think you’re thinking of Jack Hanna. Right you are. Lanny will be telling a nationwide audience about how they can be involved in bringing hope to Africa, which I think is a pretty darn worthy goal. So for the next 24 hours I’m going to participate in a hourly tweet-off, where I toss #lannyonleno into every last tweet. If you’re a twit on Twitter, I need you to re-tweet those things, and make up your own, so that we can push #lannyonleno to a Twitter trend and get this guy on the show. In return, I expect nothing except maybe for Lanny to tell people that I took a creative approach and they should follow me on Twitter and maybe invite me to fly to New York with him and perhaps take back some of the mean and nasty comments he may or may not have made. So that’s it. Check out Lanny’s site and subscribe to his feed, and enjoy the next 24 hours. If you need me, I’ll be on Highway 70 pointing at the sky. see now this is why i always wanted you to be on my staff and why i think there is a possibility that you are my son. you are the only one who has the creative ability (aside from my pet platypus who has a prosthetic hand) who can write like that. and i don’t mean the scratches you make with those crayons. it’s the content. the flow of streaming content that filters through the cerebral cortex and gets captured by the proteins affixed to the hypothalamus and then pushed on through the system to created new neural nets. that is what i am talking about. some people just write words. you create new neural nets. im proud of you son.